A federal grand jury indicted N.C. Republican Party Chairman Robin Hayes, political donor Greg Lindberg of Durham, and two Lindberg associates on charges of wire fraud, bribery, and making false statements to law enforcement agents. The four allegedly orchestrated a scheme in which they would give Insurance Commissioner Mike Causey, a Republican elected in 2016, campaign contributions. In return, Causey would allow lax enforcement of regulations that would help Lindberg’s insurance companies. The indictment, handed down in March, was unsealed Tuesday. The four men pleaded not guilty at the federal courthouse in Charlotte. Each was released on a $100,000 bond, ordered to surrender their passports, and report any travel to probation officials, The News & Observer reported. 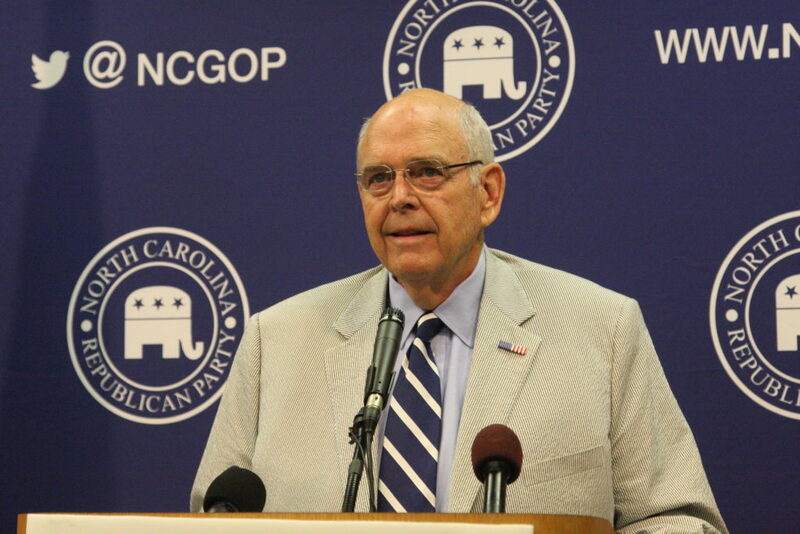 Hayes announced Monday he was retiring as chairman of the state GOP at the end of his term. According to the indictment, Lindberg offered to give $2 million to support Causey’s re-election campaign, using an independent expenditure organization and the state Republican Party as conduits. Hayes allegedly joined the scheme and lied to FBI agents when asked about it. Causey cooperated with the investigation from the outset, turning over to the federal government a $250,000 contribution Lindberg made and helping the FBI by recording phone calls and conversations. Lindberg was the subject of a lengthy Wall Street Journal profile published in late February outlining the elaborate ways he bought nearly 100 companies by diverting $2 billion from life insurance companies he owned to underwrite his other businesses. “The sheer scale of Mr. Lindberg’s use of insurance assets to invest in his own businesses has little precedent in recent decades, industry experts say, and exposes hundreds of thousands of policyholders to an unusual and potentially risky strategy,” the Journal reported. Lindberg also became North Carolina’s largest campaign donor, providing $5.4 million in 2017 and 2018, primarily to Republicans, the Journal said. The indictment says in February 2018 Lindberg and associates John Gray and John Palermo tried to ply Causey with campaign contributions, hoping the Department of Insurance would remove a senior regulator whose duties included overseeing GBIG, a company Lindberg owns. Lindberg said the regulator was “deliberately and intentionally hurting [Lindberg’s] reputation with other regulators.” He wanted Causey to hire Palermo to replace the regulator. Causey balked at the idea. Lindberg then suggested moving the regulator to a different division in DOI and replacing her with another division head. Causey didn’t go along with that plan, initially, delaying the process for months until Lindberg wrote checks to the Republican Party and the independent expenditure group. It’s against the law for a donor to give money to a political party and direct it to an individual’s campaign. Former Gov. Mike Easley, who in 2010 accepted a felony plea for campaign-finance violations, was cited by the State Board of Elections because his 2008 campaign for governor entered a similar scheme. According to the indictment, Lindberg gave $500,000 to the state GOP in June and July. The party transferred $250,000 from Lindberg to Causey’s account by early August. The FBI began interviewing the four targets of the investigation later that month. The indictment says during an Aug. 28 interview with FBI agents, Hayes denied any knowledge of a campaign funding arrangement involving Lindberg and his associates to help Causey’s campaign. Hayes also allegedly said he knew nothing about a plan to move around top officials at DOI. After Goodwin lost, Lindberg hired Goodwin as a consultant. Goodwin is chairman of the N.C. Democratic Party. He told the Journal he was cooperating with the investigation. “Greg Lindberg is innocent of the charges in the indictment and we look forward to demonstrating this when we get our day in court,” said Anne Tompkins, Lindberg’s attorney. Editor’s note: This story was updated after initial publication to include a statement from Greg Lindberg’s attorney Anne Tompkins.